Introducing the prices of your tickets for your journey in Switzerland. Created by Antoine Bellanger, 2014 - 2016. 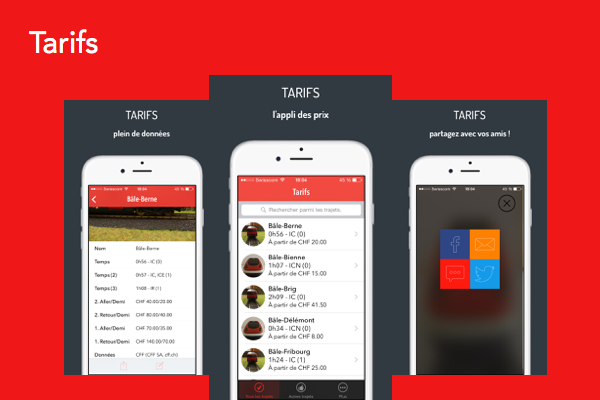 Tarifs is an app created to simplify your travel life. Are you taking the train often ? Is it long and boring to look up for the price of your journey ? Tarifs is here. Search for your trip and access to the 8 different prices, depending on your travel class, number of trips (one-way or return) or if you possess a half-price card. The data provided into Tarifs is static and was queried by myself. It it my first app and at the time I did not know about querying servers. I have decided to stop updating the app as only few users are using it now. In the eventuality of a price change, it would take too much time to update all the data.